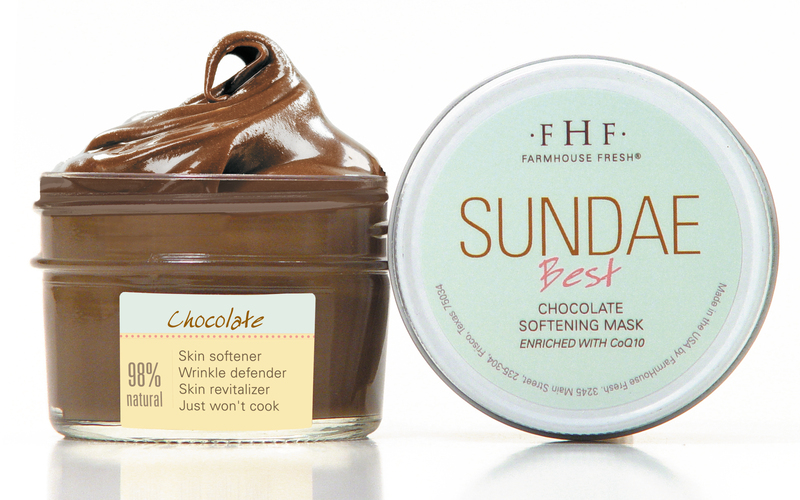 Camille loves this mask because you can feel it working by the tingly feeling you get, plus you get hydration AND anti-aging benefits. Not to mention it smells delicious! Cassie chooses this product because it’s so helpful for her nagging low back pain and it’s easy to wear a patch at work or in bed. 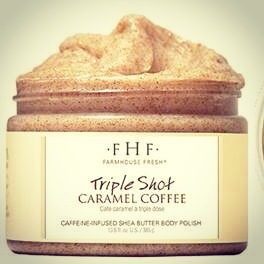 Cammie picks this scrub because of the coffee to exfoliate and shea butter to moisturize. She also loves the aroma, it reminds her of a warm sweet coffee drink for fall! We’re excited to share 3 of our favorite products with you this month! 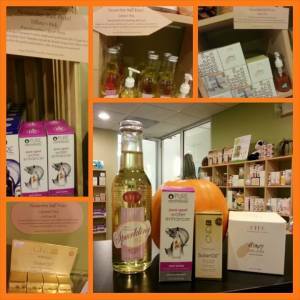 Each of our staff picks will be 10% off throughout September. I’m sure you’ll see why we love them so much! and it stays on during all of her outdoor activities. uneven, red and freckly skin tone plus it is one of the only SPF products she’s used that doesn’t irritate her eyes. Cassandra picks this serum because it is light weight, hydrating and is power packed to lighten sun spots! It feels great to wear alone or under a moisturizer. 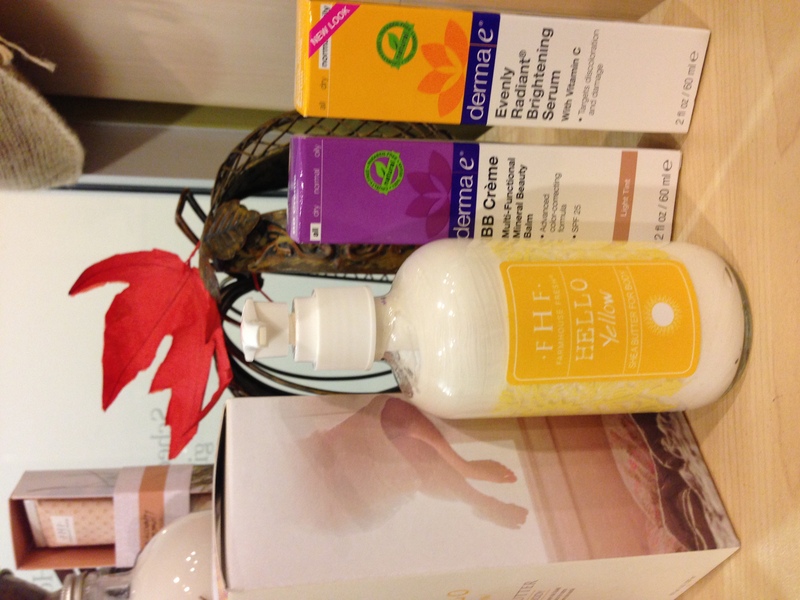 Derma E’s BB Cream is the Best Thing Ever! 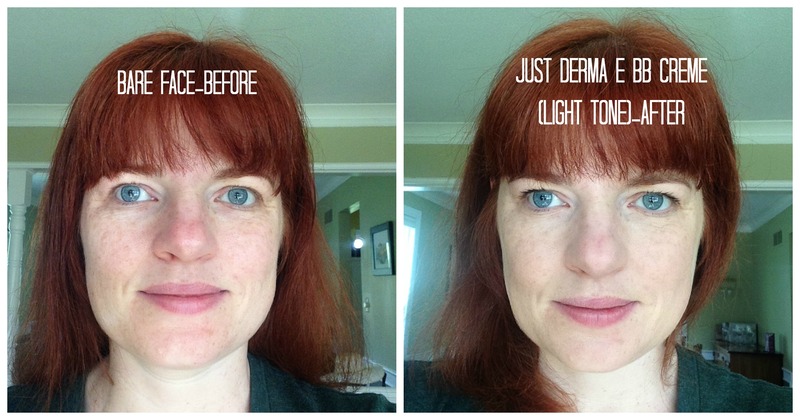 Since the day Derma E’s BB Cream hit our shelves last year, I was in love. 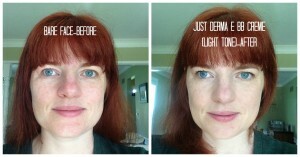 It is perfect for evening my blotchy skin tone and hiding the redness (that is made even more pronounced by my red hair!) It also has SPF 25. I’m sensitive to almost every sun screen product, so the fact that I can’t smell or feel the sunscreen in this product is a miracle to me. I wear it every single day as a moisturizer and often, with mascara, it is the only “cosmetic” I need. And yes, it isn’t just for women. 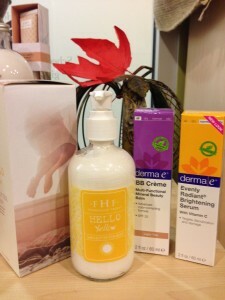 It is perfect for anyone with uneven skin tone looking for some sun protection and light hydration. I decided the best way to tell you how awesome the product really is would be to SHOW you my before and after with and without the product. We have BB Cream in 2 shades and I am not sure how, but those two shades blend really well with most skin tones. Stop in to give it a try! We’re excited to announce our May 2014 Staff Product Picks! 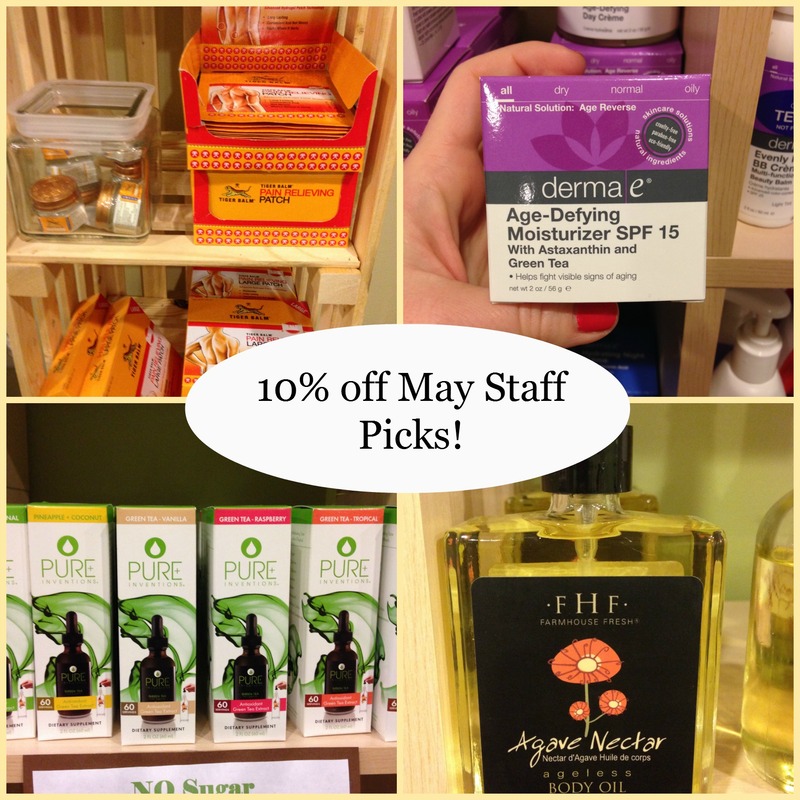 Each of these staff favorites will be 10% off for the entire month of May! Katie loves that this moisturizer is very hydrating and now that she’s outside more, she likes the light SPF protection too. Justin likes that this warming product really works! He uses the salve during Sports Massages and uses it personally for his post workout pain. 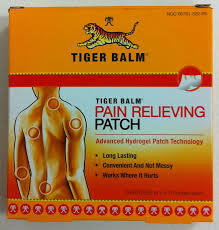 He also likes how easy the patches are to use. Cassie likes this calorie-free alternative to high sugar cocktails and mixers for a light summer drink. Mix it with sparkling water and serve over ice or try a dropper full of Blueberry (her favorite!) in a glass of champagne for a fun patio cocktail. One of our clients said it works great with her soda stream! Tiffany loves this light hydrating oil. It is perfect for moisturizing in the summer, right after the shower. She picked it for the subtle, sweet fragrance of the Agave Nectar. Many of you have noticed we redecorated our retail area last month! We also started a new monthly special to help you find our FAVORITE products. In April, we’re featuring “Staff Picks” from Cassandra, Camille, Stacy, and Clair. 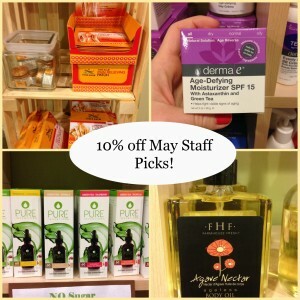 Their favorite products will be 10% off throughout April! CASSANDRA loves the Farmhouse Fresh WATERMELON BASIL VODKATINI BODY SCRUB because it is a great way to keep your skin hydrated and silky soft through all of your summer activities. It smells so wonderful you might be tempted to make a vodkatini you can actually drink! STACY loves the Farmhouse Fresh CLEMENTINE OIL because it is a perfect light and fresh moisturizer for spring. CAMILLE loves the DERMA E MICRODERM SCRUB because you can make it as abrasive or gentle as you need according to your skin type and it is a very effective way to remove skin impurities. CLAIR loves the DERMA E OVERNIGHT PEEL because she just started using it and is seeing immediate results in evening her skin tone!